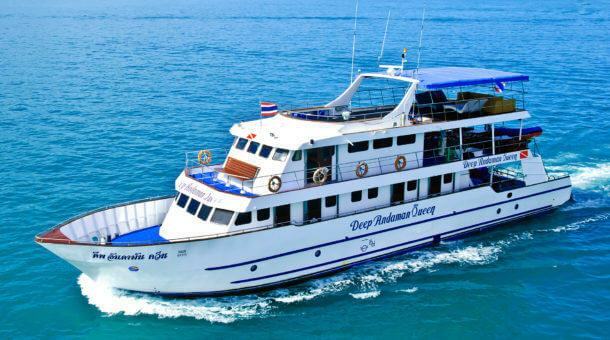 Diving in Thailand and Myanmar - The luxury liveaboard Diva Andaman runs 6 night trips to the Similan Islands and the Mergui Archipelago. The boat was completed in 2009 and has been one of our most popular boats. Early booking is suggested. It's all about service, relaxation, great food, and don't forget the diving! The boat is very large for just 14 guests, with a lot of deck space on 2 levels for relaxing between dives. Food is described by the owner as "gourmet" - let's say its a touch above the usual liveaboard cuisine. A selection of wines are for sale on the boat and every cabin gets a free bottle of champagne! Diva Andaman has 7 cabins for a maximum of 14 Guests. There are 5 double cabins and 2 twin cabins on the lower deck. Every cabin has air conditioning as well as en suite facilities, a safe, fridge and flat screen TV. All liveaboard trip prices are per person. Diva Andaman is an absolutely top quality boat, hand built and designed by divers who know what they want from a liveaboard – not too many guests, lots of space to relax, a crew who will look after you, great food … Built with traditional materials in a typical South East Asian style, SY Diva Andaman also complies with all international marine safety standards. Wind combined with engine power. 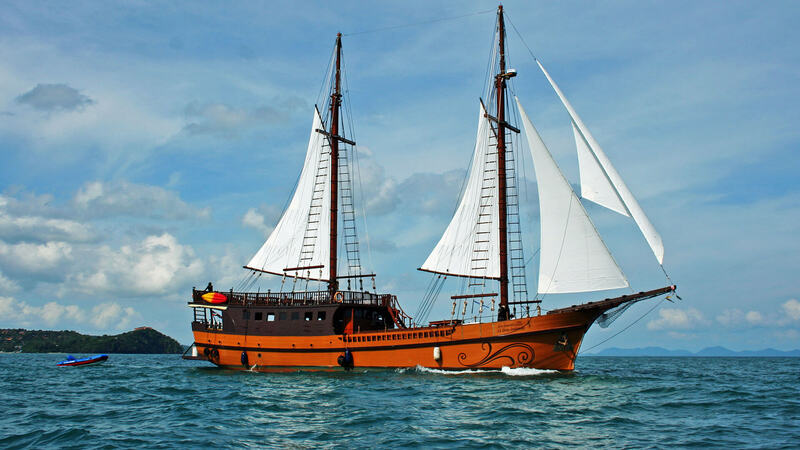 Her 400 square meter sail area makes SY Diva Andaman a real sailing boat with a 425 HP engine used as a backup system. The cabins are all on the lower deck, a mix of double and twin, all with en suite bathroom, fridge, TV, bathrobes, safe. All cabins are air-conditioned. On the main deck is a spacious dive deck. The crew will help carry gear down to a set of tank racks on the dive platform. There are 2 dinghies (RIB’s) used for the diving, so the guests can be dropped right on the dive site while the big Diva stays away from the reefs. Also on the main deck is an indoor saloon / dining room with the galley where food is cooked fresh right infront of you. The indoor saloon is easily big enough for all guests, but there is a lot more space! In front of the saloon is a large open deck which will be covered by a bimini / sunbrella to provide shade. And on the very top deck is a large seating and relaxation area where you can eat, enjoy your free bottle of champagne or have a massage – 3 of the crew are certified masseurs! The Diva Andaman trip prices include full sets of rental diving equipment. Torches for night dives are included. 15 liter tanks are extra 50 Baht per dive. Nitrox is available on board @ 300 Baht per 12 liter tank fill or 350 Baht per 15 liter tank fill. PADI Advanced Open Water course is 16,000 Baht. PADI Enriched Air (Nitrox) course is 12,000 Baht. Drinking water, coffee, tea, sodas are included. Local beers are 90 Baht. Many wine options available with prices from 150 Baht per glass. Imported Belgian beers are 200 Baht. Cocktails 300 Baht. Please complete the form below to send an availability or booking enquiry to Sunrise Divers. You are also welcome to send a direct email to info@sunrise-divers.com or call our mobile hotline +66846264646. We are based in Phuket, Thailand. We will reply as soon as possible with full trip information and details on how to make a booking. Payments can be made by credit card (no card fees) or bank transfer. We look forward to hearing from you soon! 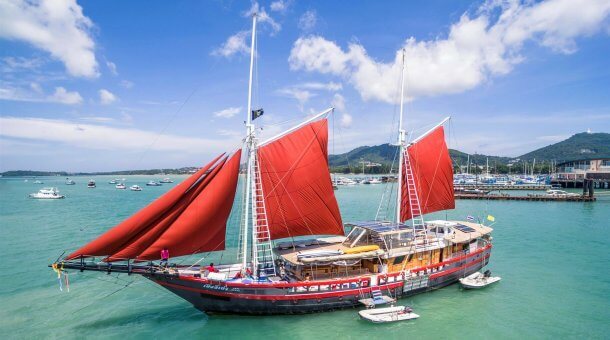 Diva Andaman runs trips for 6 nights to the Similan Islands, Koh Bon, Koh Tachai and Richelieu Rock and also 6 night trips to the Mergui Archipelago in Myanmar. Note : This is an approximate itinerary. 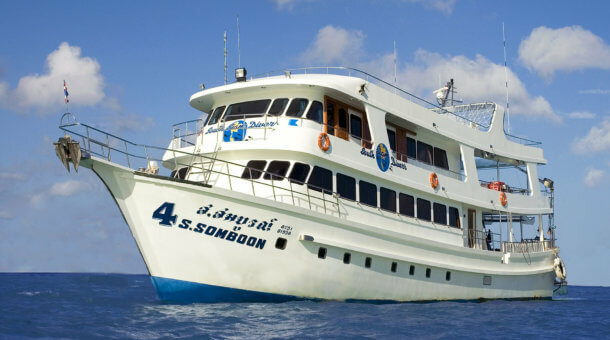 The 6 night trips include 19 dives at the Similan Islands, Koh Bon, Koh Tachai and Richelieu Rock. Exact dive times will vary from day to day. There will be time for a couple of beach visits during the trip. Note : This is an approximate itinerary. The 6 night trips include about 19 dives normally including Western Rocky, Black Rock, High Rock, 3 Islets, and sometimes Burma Banks. Exact dive times will vary from day to day. There will be time for some beach visits during the trip. Note that the trips depart from Ranong and we suggest meeting at Ranong, but transfers can be arranged at extra cost from Khao Lak or Phuket.